An achievement: Five attempts to lay a transatlantic cable were made over nine years—in 1857; two in 1858, 1865, and 1866—before lasting connections were finally achieved. The first official message to pass between two continents was a congratulatory note from the Queen to the President on August 16, 1858. The cable was destroyed the following month when Wildman Whitehouse applied excessive voltage to it while trying to attain faster telegraph operation. 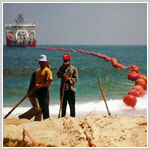 The Atlantic didn’t get broadband until 1988, when fiber-optic cable was laid across it. Chewy: Deep-ocean cables can be 17-20 mm (0.7-0.8 in), like a garden hose. At least 40 cable faults have been caused by shark and “fish bites”, verified by the presence of fish teeth. Entangling: Between 1877 and 1960, at least 16 whale entanglements took place with undersea cables. Today, the most common problems are anchors and trawls getting caught in the cables. Fast: On the 1858 cable and it took 2 minutes to transmit just one character (compared to ten days for a message by ship at the time). Today, each fiber pair within a cable can carry information (including video) equivalent to 150,000,000 simultaneous phone calls. In 2008, the world’s first transatlantic transmission at 40 gigabytes per second was made between Luleå, Sweden and Manhattan over the TAT-14 cable. File sharing for navies: The US navy didn’t mind sharing some of the Soviet Union’s information during the Cold War by tapping into USSR copper cables. According to ZDnet, today’s fiber-optic cables did occasionally prove to carry too much data for the NSA’s budget. As you might have noted from before, we are fascinated by these high-powered garden hoses. If you know of more cool facts, please don’t hesitate to add them in the comments below. Great, fun info – glad you shared this information here which isn’t always communicated. You may want to take a look at http://www.hiberniaatlantic.com – they are currently in the process of laying a new submarine cable connecting N.Ireland to Europe & N. America. Let me know if I can provide you with more information!